After updates for the AT&T, T-Mobile, and Sprint variants of the Samsung Galaxy S4 started pushing out over the last couple of days, US Cellular has decided to join the party. 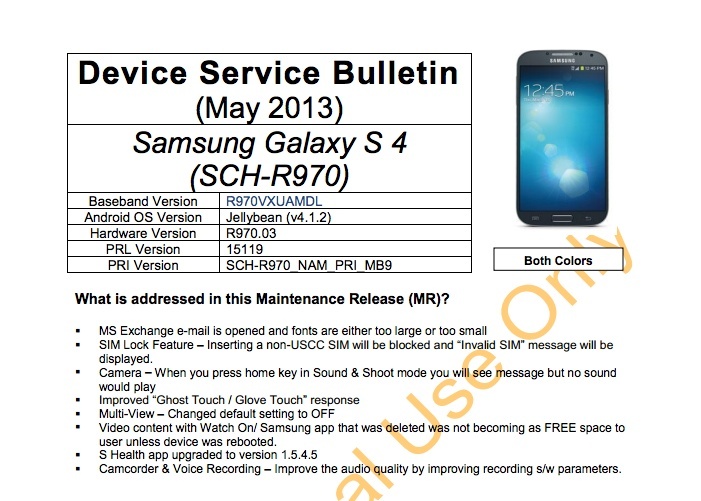 In the update that is scheduled for this month (around May 10), phones will jump to build number R970VXUAMDL. The update also includes a SIM lock, improved “ghost” touch, a camera fix, new version of the S Health app, and improved audio quality when recording video. The full changelog can be found below. One thing we are certainly confused about, is the fact that this document says the update will be Android 4.1.2. Unless I’m mistaken, all Galaxy S4 models (including this one) should have launched with 4.2.2, so that must be a type-o. Video content with Watch On/ Samsung app that was deleted was not becoming as FREE space to user unless device was rebooted. The update can be downloaded by going into Settings >> About Phone >> Software Update.